Ivy is a genus of evergreen perennial vines containing dozens of species and cultivars. Ivy responds well to asexual or vegetative reproduction by division. Each healthy division of a mature root mass will result in an ivy plant identical to the parent from which it was taken. This feature allows ivy to be planted and established quickly over a wide area or shared with friends easily and at a low cost. Pull the divisions apart with gloved hands or use a sharp clean garden knife to slice off squares of chunks ivy. Make the divisions any size you like, but ensure that for every division there is healthy top foliage, soil and roots. Transplant the divisions into nutrient-rich soil immediately, either into the ground or a container. Do not let the roots dry out between harvesting and planting. Keep the soil level on the plant stem consistent from the old planting site to the new. Water the divisions and surrounding soil deeply until drenched several inches down. Maintain evenly moist soil at all times until the divisions are well established and spreading into their new soil. Test the soil's moisture levels. For outdoor ivy plants, use a screwdriver or similar implement to check if the soil is moist at a depth of 6 inches. For indoor plants, insert your finger 2 inches into the potting soil. Watering should be withheld until the soil is dry at these respective levels. Apply water to the ivy plant's base instead of on its foliage. This reduces the risk of the vine contracting a foliar fungal disease like powdery mildew or blight. Irrigate until water drips out of the pot's bottom drainage holes, according to the American Ivy Society, or until the soil is moist at a depth of 1/2 foot for outdoor plants. Water again after fertilizing the ivy. The University of Florida recommends fertilizing indoor plants with any standard houseplant fertilizer and outdoor plants with a 15-5-15 or 12-4-8 product. Spread the fertilizer according to its labeled rate, as potency varies by product, then water lightly to help carry the nutrients to the ivy plant's roots. Protect your hands by wearing rubber gloves and be sure to dress with long pants and sleeves. Do not wear open-toed shoes. Dip a paintbrush into the herbicide and apply it directly to the base of the unwanted ivy vines. Be careful not to get the herbicide on any plants that you wish to keep. If the ivy is entangled with plants you wish to keep, use plastic gardening sheets to protect the desired plants. Re-apply the herbicide one week after the initial application to any remaining vines. Rake the ivy with a dethatching rake to pull out portions of the root system and break them apart. For small batches of ivy, you may be able to rake it and pull it out of the ground by hand, but this isn't practical in many situations. Mix herbicide solution in a garden sprayer. The University of Nebraska-Lincoln Extension Service recommends the use of a 2,4-D herbicide for ground ivy. Follow the mixing directions closely and never exceed the recommended amount of herbicide. Spray the herbicide solution directly on the ivy. Keep in mind that the herbicide may kill or damage any other plants it touches, so be especially careful when you spray along the edges of the ivy patch. Repeat the application if the first spray does not kill it. The directions on the herbicide package should have recommendations on how often it's safe to apply it, so figure out the appropriate time frame for the second application from the package instructions. 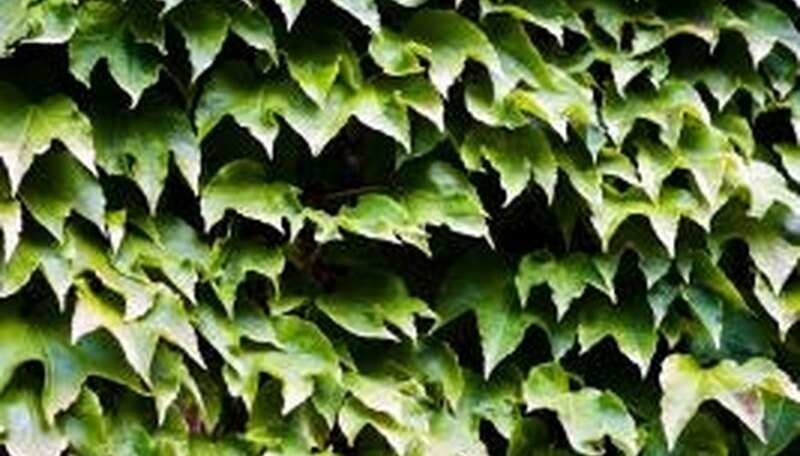 Determine whether the ivy is alive or dead, as it is much more difficult to remove if it is dead and dry. Use a water hose on the spray setting to soften up the vines before pulling them away either way. If the ivy is dead, keep in mind that you will need to be as careful as possible when removing it so you have minimal scraping to do. Pull the ivy away from the stone wall, starting up as high as the vines go and working on downwards. Use a scraper to carefully scrape off any tendrils and suckers, which are usually the parts of the vine that stick onto the wall after the vines are pulled down. Work slowly and carefully, scraping at an angle to minimize any damage to the stone wall. Use a ladder if necessary to reach higher vines. Use pruning shears to chop the ivy right at the ground root. Discard the vines in the trash or a compost pile. Spray the roots with a solution designed to kill them permanently, such as Roundup or Brush-b-Gone. Cut pieces from another ivy plant, or buy plants that are already rooted. If you decide to use cuttings, make them 12 to 18 inches long. Dig holes for your ivy ground cover 4 to 6 inches deep and 12 inches apart. Place an ivy root ball in each hole, and cover it with soil. If you use cuttings, place the end of one cutting in each hole. Press down soil to remove air pockets. Lay down 3 inches of hay or other mulch around the base of each ivy ground cover plants. This will help retain soil moisture. Water your ivy regularly the first few weeks after planting. Water until moist to the touch, keeping the soil moist but not soggy. Apply 1 lb. of 8-8-8 fertilizer to the soil four to six weeks after planting. Cut off a small section of ivy--about 3 feet by 3 feet--in an inconspicuous spot to check how much the ivy is rooted into the brick. See also what the bricks look like underneath. The bricks may be stained or damaged and in need of repair. Wear garden gloves for this. Cut the remaining ivy close to the wall with a pair of hand clippers. Start near the top and work your way down. Do not pull. 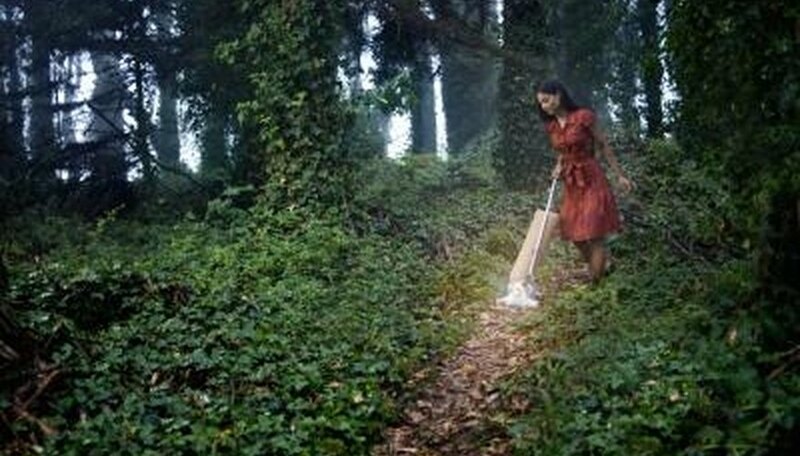 Pulling off ivy is more likely to cause damage. Wait until the suckers left behind dry up and turn a dark color. This could take a week, but don’t wait longer than two or three weeks when the suckers will be too difficult to remove and might oxidize and stain the bricks. Scrub the dry and dark suckers with a stiff fiber brush dipped in water mixed with laundry detergent. Use about 1 tbsp. of detergent per gallon of water. Again, start at the top and work your way down. Plant in hanging baskets for best results. Although Swedish ivy can be grown in pots, it trails over the side of the pot and will attempt to curve up toward the light. To grow the plant in a pot, you must keep some table space around it and it may become unshapely. Give Swedish ivy as much direct sunlight as possible. In lower light, these plants will produce fewer leaves, and the leaves will be pale. 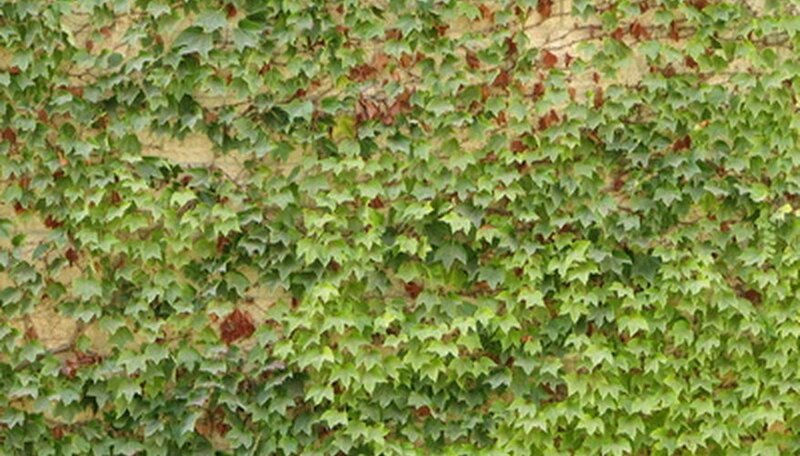 Provide Swedish ivy with warm temperatures during spring, summer and fall. During the winter, opt for a cooler temperature of 60 degrees Fahrenheit. During spring, summer and fall, water as much as several times per week to facilitate the plant's fast growth. Cut back to once a week in winter, when the plant grows less. Hang Swedish ivy outside from a tree branch or on a porch for the summer. A Swedish ivy will thrive in a shady outdoor spot if you water it daily. Occasionally pinch or cut new growth. Swedish ivy will branch if pruned back to a leaf bud. This will keep the plant full. 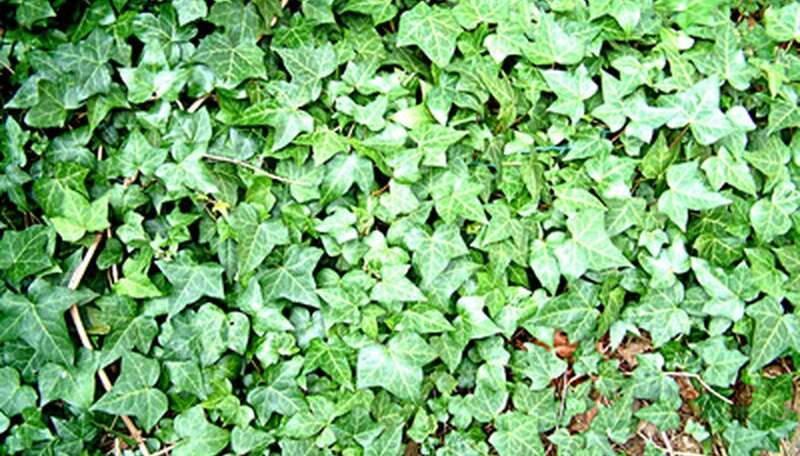 English ivy is not a heavy feeder, but it does need to be fertilized regularly. Outdoor ivy plants need a dose of 15-5-15 fertilizer twice a year. Indoor ivy plants need a 20-20-20 dose of plant food six to eight times per year. 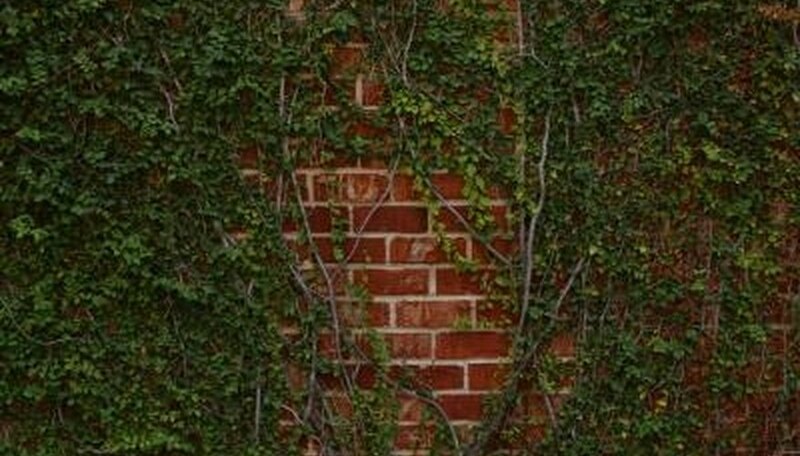 Pull the ivy off the bricks, detaching as many vines as possible. Gently yank off the vines to prevent damaging weak bricks or mortar. Wear gardening gloves to protect your hands. Scrape off lingering ivy roots and stems too strong to pull off with your hands. With a plastic scraper, loosen as many roots and stems from the bricks as possible. Pull the loosened ivy roots and stems off the bricks, using your hands. Examine the bricks for fuzzy tendrils left behind from the ivy roots. If you discover any hairy tendrils lingering on the bricks, scrub them with a synthetic household brush. Detach as many tendrils from the bricks as possible. Inspect the bricks for tendrils too stubborn to scrub off with the dry brush. If you discover stubborn tendrils, prepare a solution of 1 tbsp. liquid detergent and 1 gallon fresh water. Mix the detergent solution in a pail. Scrub the remaining stubborn tendrils off the bricks using the brush and the detergent solution. Dish detergent softens ivy tendrils. Rinse the bricks thoroughly with a garden hose. Flush off all ivy residue and detergent. Weave the length of ivy around the frame or trellis clockwise. Avoid winding tightly. Wrap a length of garden twine around the ivy. Cross the ends of the twine between the ivy stem and the frame, then pass the twine around the frame and tie. The twine should resemble a figure-eight with the ivy in one opening of the eight and the frame in the other opening of the eight. Tie additional lengths of twine every 12 inches, or where the ivy sags. Tie loosely and avoid bunching leaves under the twine. Check the ties on the ivy once a month. Replace or loosen the ties if they begin to bind the growing vines. As the ivy begins to cling to the frame on its own, remove the ties. Pinch off the tips of new vines growing beyond the frame, if desired. Alternately, weave them into the frame and tie loosely in place.